Gifted: A Working Title For The X-Men TV Show | Nerd Much? There have been varying trickles of casting for the upcoming X-Men TV show, but no title quite yet. 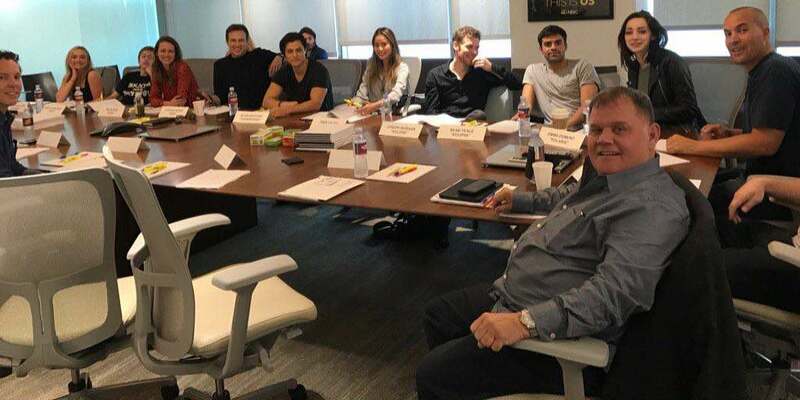 Just recently, however, director Lauren Shuler Donner tweeted a photo that reveals the title, presenting the “cast reading for ‘Gifted’.” The image also revealed a few new cast members, namely Joseph Morgan, who is best known for his role in The Vampire Diaries and The Originals. However, according to EW, Morgan was simply filling in for the reading. The other stars of Gifted are Stephan Moyer (True Blood), Jamie Chung (Once Upon A Time), Amy Acker (The Cabin In The Woods), Emma Dumont, Percy Hynes White, Blair Redford, Sean Teae, and Natalie Alyn Lind. Gifted is only a working title and will likely not stick, as it’s not very informative or descriptive of what the show is about or based on. As sweet as the thought is, since Xavier has long called his mutants such. Nonetheless, the new show will focus on a family as they run from the government in an attempt to protect their mutant child. They eventually meet a few underground mutants, like Blink, played by Chung, and the notorious Polaris (the daughter of Magneto) by Dumont. All are led by Redford’s character, Sam. The show’s executive producers are Bryan Singer, Donner, Simon Kinberg, Jeph Loeb, and Jim Chory. The pilot is written by Matt Nix, who also wrote Burn Notice. Are you looking forward to a live-action X-Men TV show? Let us know in the comments below!